Yes, here comes the preparations of the rightful libel lawsuit from Nick Sandmann of Covington Catholic School, who was made front and center of a mainstream media leftist smear campaign, after he was harassed by a professional agitator, Nathan Phillips, a native American liar, who said he was a Vietnam veteran, but he wasn’t. What did Nathan Phillips do? He got up in the faces of the Covington Catholic School kids, in order to cause the latest leftist outrage presumably on instruction by mainstream media, which we have already seen so many times, to try and further their political agenda of racial division. The difference here is, that this is a really big pending lawsuit now for some, for which the mainstream media, CIA celebrity shills, and celebrity Satanists, and plenty of brainwashed deranged leftist agitators will have to pay for, in droves. For what is right about slandering an innocent teenager that’s only 16-years old, on all mainstream news media outlets, simply because Nick Sandmann and his school friends are white catholic school students? We are open to answers in the comments section down below, and wee would be curious as to how anyone can justify the mainstream media’s disgusting actions, before name’s are named in this article. Nick Sandmann and the Covington Catholic high school teens were initially set upon by the notoriously racist Black Hebrew Israelites for starters, spewing their hatred onto them for being white for over an hour, commenting on their MAGA hats and other demeaning words. 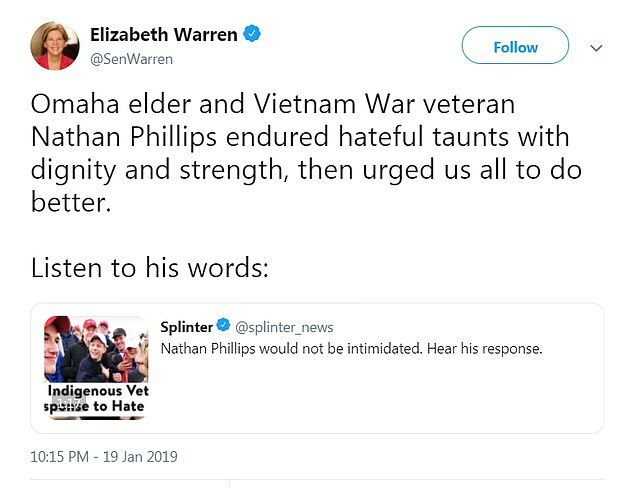 Only moments earlier for the Israelites to also insult Native Americans, and then somehow Nathan Phillips beceme the mainstream medias focal point, as he got up into Nick Sandmann’s face, whilst repeatedly beating a drum. Well, what did Nick Sandmann do? He simply smiled and smirked, as surely this was a very awkward situation captured on video for all to see. But, what you didn’t see, was what actually happened. Let’s now check up on the real facts of that day at the Indigenous People’s March in Washington D.C., to show who was really in the wrong, shall we? Before we list a list of some of the guilty agitators in the mainstream media, and on social media, including celebrities, which will all hopefully incur paying the price for their divisive lies and racist propaganda against the Covington Catholic School kids. How about that for some real news of that day at the Indigenous People’s March in Washington D.C., about how the mainstream news media mob twisting the story to fit their narrative against white people? So, who are the real racists here? We think it’s the Black Hebrew Israelites, Nathan Phillips and some of the Native Americans of the Indigenous People’s March, for telling the Covington Catholic School kids to go back to Europe. Plus, add to that the vile lies of Nathan Phillips on all mainstream news media outlets about the high school kids being dangerous, and of also instigators of racial hatred, plus with his lies of serving in the Vietnam war, making him an incredulous instigator of division and lies, paid for with his time on all the mainstream news media networks, to rouse deranged liberals. Plus, following on from the news media furore of demonising Nick Sandmann and the high school kids, as being racists on worldwide television, which is no less, completely untrue, has now backfired, big time! Since Nick Sandmann and his legal team have sent out preservation letters on this past Friday, which are the first steps in possible libel and defamation lawsuits, asking those that received the letters to preserve documents both written and digital, that could be used as evidence in a potential case or lawsuit, over the aftermath of the media’s portrayal of Sandmann and their own actions. Let’s countdown some of the names who should really be on that list. First off! Let’s begin with CNN’s Don Lemon, Chris Cuomo and Anderson Cooper for their distorted lies and divisive rhetoric against the Covington teenagers, to rally their base of liberal derangement. Plus, how about bit part actor Michael Rapaport for his hatred on social media against the Covington kids. He should definitely be sued for his this, we think! In fact, he makes us sick! He’s a classless moron, and this is supposed to be a grown man…. What a foul mouthed moron he is… Let’s take a look. However, more than 50 celebrities, politicians, and media organizations are now facing lawsuits from the teen, and his seven lawyer legal team, over the mainstream media’s portrayal of the Covington Catholic High School controversy. We say that’s good news, don’t you? Well, adrenochrome addicted former funny person, Kathy Griffin, makes the list, along with Satanic high priest actor Jim Carrey, for his leftist “propaganda” art, as does Alyssa Milano, a former actress, that called ‘the MAGA hat the new white hood’. She also claimed that the kids basketball team engaged in a new Nazi salute, which was wholly untrue, in another one of her deleted tweets. Kathy Griffin just can’t catch a break these days, until she learns to keep her mouth shut, to prevent more garbage from spilling out. Here’s Ilhan Omar tweeting a bunch of lies about the incident, citing what the Black Hebrew Israelites said and trying to pass them off as what the Covington kids said, all in order to further her hateful agenda against white people, after being sworn into Congress with a Quran, after suspected widespread voter fraud in Minnesota. God help America! Nick Sandmann’s principal lawyer, Todd McMurty of L. Lin Wood, said about the possible libel defamation case, ‘We want to change the conversation,’ he told the Cincinnati Enquirer. Attorney Todd McMurty now intends to demand written redactions and apologies to steer away from possible litigation, but he stated that not all organisations serviced with preservation letters will be sued. And, here’s some of the list of the people and organisations whom were sent the preservation letters already, in a prelude to being serviced with lawsuits for defamation of character, and presumably other charges, which will be inside their letters. Well, let’s hope that will be a lesson to all of them, and that this will now see various lawsuits being filed and the guilty parties will be libelled for their reactions, in doxing and a 16-year old high school student for simply smirking in the face of a very awkward and highly strange situation at the Indigenous People’s March in Washington D.C.
Lastly, we definitely believe that Don Lemon should be added to that list and sued as an individual, as should Michael Rapaport and plenty of others, to round off what’s already been a terrible act of alienating and attempting to ruin the future of a perfectly upstanding young American citizen. We will keep you updated on this story, once many future resolves are reached in this story. Please watch the official L. Lin Wood video below, called ‘Nick Sandmann: The Truth in 15 Minutes’ to get an even broader understanding of what happened that day, before the mainstream media’s attack and smear campaign.